A crime and law drama, The Client deftly delivers on the intriguing premise of a young boy harbouring a secret who hires a scrappy lawyer to help him deal with the FBI and the mob. In a Memphis suburb, twelve year old Mark Sway (Brad Renfro) and his younger brother Ricky live in a trailer park on the wrong side of the tracks with their mother Dianne (Mary-Louise Parker). When the two boys go to the woods to illicitly smoke cigarettes, they stumble onto sweaty lawyer "Romey" Clifford (Walter Olkewicz) about to commit suicide. Before he pulls the trigger, Romey confides in Mark that he is in trouble with the mob, particularly hitman Barry "The Blade" (Anthony LaPaglia), because Romey knows where the mob has stashed the body of a murdered Louisiana politician. Traumatized by the suicide, Ricky goes into a catatonic state and is hospitalized. Romey's death creates a media circus. 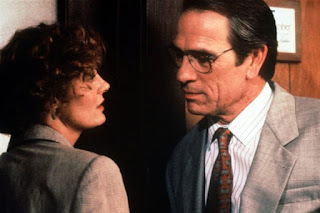 Bible-quoting US Attorney "Reverend" Foltrigg (Tommy Lee Jones), who has ambitions to run for Governor, and a gaggle of FBI agents descend on Memphis to interrogate Mark, hoping that Romey revealed to him the location of the dead body. The mob sends in an intimidation team to ensure that Mark stays silent. Realizing that he is in over his head, Mark hires lawyer Reggie Love (Susan Sarandon), a fledgling neophyte just building her career after a bitter divorce. Reggie finds herself in the role of lawyer, protector, and advisor to a young boy who is forced to grow up in a hurry, with threats on all sides. Directed by Joel Schumacher, The Client is another of the high quality John Grisham novel adaptations that were popular in the 1990s. A legal drama with hardly any courtroom scenes, the film does suffer from a few of the usual ailments, including supposedly ruthless bad guys who become incredibly incompetent at key moments. But overall, this is a slick dramatic thriller with a compelling story, plenty of humanity and a southern setting dripping with the promise of menace and corruption, and Schumacher delivers a polished package in under two hours. The Client benefits greatly from a glowing warm heart at its centre, where the bond between young Mark Sway and damaged lawyer Reggie Love is forged in common pain. With his own mother stranded at the bedside of his younger brother and both the FBI and the mob breathing down his neck, Mark needs a resourceful mother figure. And with her own children taken away from her in a bitter divorce battle, Reggie has a hole in her life where her kids used to be, and finds a case to help her rise above her own insecurities. It's a credit to the film that their relationship is never smooth. Reggie and Mark argue more than they cooperate, as may be normal for any mother when her pre-teen is carving out his identity. But when they do join forces and work towards a common goal, often taking turns to goad the best out of each other, they become an effective team, solving a complex suicide mystery and more importantly helping each other heal. While there are plenty of scenes of mob plotting and legal sparring to keep the drama going, it's the tender connection between woman and child that elevates the film. Another of The Client's plot strengths is the singular focus on the Romey suicide. Too often in legal thrillers, the initial mystery is followed by several more crimes that receive ridiculously scant attention. Here it is solely Romey's messy suicide that drives the entirety of the film. There are plenty of threats of more violence that could potentially befall Mark, and Foltrigg intimidates with all kinds of legal hassles if Mark and Reggie don't fully cooperate with his agenda. But The Client starts and ends with the implications of Romey's suicide and the secret location of a dead body that he may or may not have imparted to Mark. Susan Sarandon was nominated for the Best Actress Academy Award, and she is impeccable as Reggie, a fledgling but capable lawyer in the early stages of rebuilding the entirety of her life. 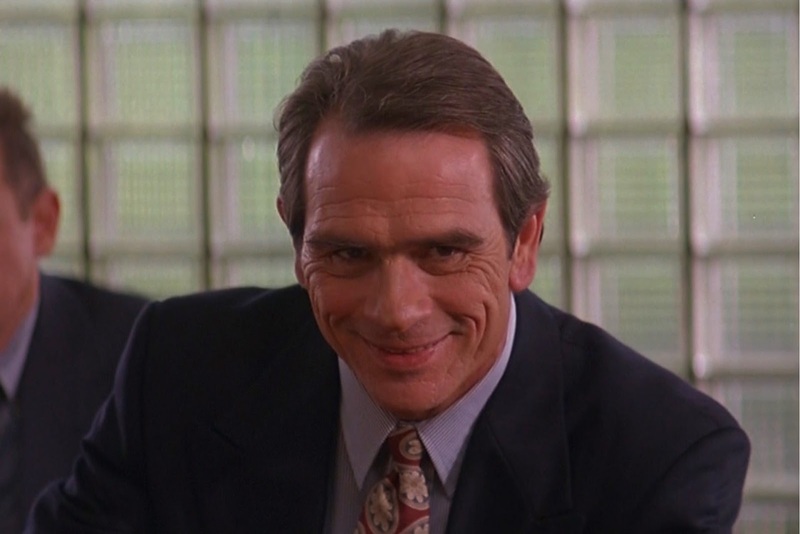 Tommy Lee Jones as Foltrigg is a perfect foil, a wannabe politician willing to bend the rules as only politicians can to get his way as expeditiously as possible, and enjoying the act of ordering around his entourage of minions. The supporting cast includes J.T. Walsh as a local FBI agent trying to curry favour with Foltrigg, William H. Macy as the doctor looking after Ricky, and Anthony Edwards as Reggie's assistant. 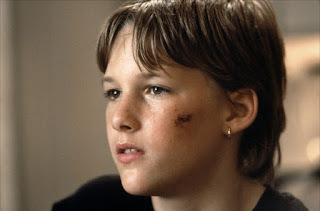 Brad Renfro gives a most promising debut child actor performance, credibly portraying Mark Sway at the centre of the action from the opening scene through to the denouement. Not all of his scenes necessarily work, but there is more than enough on display to suggest that Renfro had an above average opportunity to succeed as an actor. He unfortunately slipped into a life of addition and crime and died from a drug overdose in 2008, aged 25. The Client has a bittersweet ending, but it's a lot less bitter than the real life tragedy of its young star.